When the Lich King’s control of his death knights was broken, his former champions sought revenge for the horrors committed under his command. After their vengeance was won, the death knights found themselves without a cause and without a home. The Death Knight is the “Hero Class” of WoW. You start at level 55 and, with a bit of extra grinding, will enter the world at level 58 with a nice set of blue quality gear. You are now fully ready to inflict mayhem upon the word of Azeroth as Tank, DPS, or PvPer. 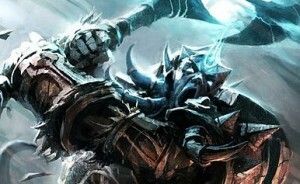 This page is an overview of Death Knights, but does not go into much detail with the three specs. See the links below for those details (gems, enchants, rotations, etc.) or scroll down the page for the overview. Death Knights, like most other classes, have three specs (short for specializations:) Blood, Frost, and Unholy. This is the “Tanking” spec. Tough and hard to kill, but not a lot of damage. The toughness and ability to handle large groups make them fun to level as well as being fine tanks. Round up a bunch of mobs and burn them down. Blood isn’t usually a PvP spec, but there are some sweet spots before you hit 100 where the can do very well. Damage will be the main concern. Death Knight Blood Spec Tanking guide – The build, gems, rotations, and more. Unlike Blood, Frost DKs do plenty of damage and do a pretty good job of spreading it around. 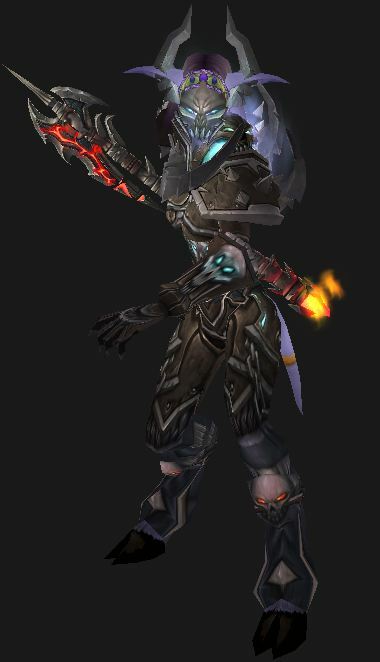 They’re the only Death Knights who can dual wield (one handed) weapons, if they choose. Not nearly as tough as Blood they can still handle several mobs with a bit of care. Their damage makes up for the lack of defense. Death Knight Frost Spec DPS guide – builds for dual wield and 2-handers, plus gems, enchants, etc. Like Frost the Unholy Death Knight does damage and lots of it. They specialize more in the diseases and have a Ghoul pet. Not nearly as tough as Blood they can still handle several mobs with a bit of care. Their damage makes up for the lack of defense. Generally Unholy is the PVP spec for DKs, but that will vary from time to time. Death Knight Unholy Spec DPS guide – Everything you need for higher DPS as Unholy. Unholy spec PvP – Damage, Diseases, Pet. Death Knight Leveling Guide – Tips, builds, and info to make your trek to the level cap that much easier. Go here and check out Dugi to get leveled even faster! Legion removes bonus armor and Multistrike and does away with attuned stats. PvP – Resilience and PvP Power are dead, though they still appear on some sub-100 gear. Hit rating and Expertise are both dead. Strength is your Attack Power and improves everything you do. Mastery is a strong stat for all Death Knights. For Frost it improves all Frost damage. For Unholy it improves all of your Shadow damage. Multistrike (MS) gives you two chances (only one in PvP) for an additional attack at 30% effect. Multistrikes can crit and can proc anything that the main strike can proc. Unholy gets additional MS benefit and MS is Unholy’s best secondary stat for PvE. Versatility adds to damage done, healing done, and (at half value) adds to your damage reduction. It’s a more valuable PvP stat than a PvE stat. Haste speeds up everything you do, including rune regeneration. Critical strikes do 200% damage (150% in PvP,) but don’t generally proc anything for DKs, which is oen reason why the value of crit isn’t as high as it is for other classes. Bonus Armor is only found on tank-appropriate (Blood spec) Non-Armor pieces. This increases the tank’s armor. Non-armor pieces that formerly had Dodge or Parry now have Bonus Armor. Attuned Stats are those stats that give you an extra 5% with one or another secondary stat. Frost: Haste – Icy Talons. Note that the tooltip (and in-game tooltip) says +20% from all sources. Tertiary Stats are bonus stats that sometimes appear on top level PvE gear. These stats have a small chance to be found on gear as an augmentation. There are no enchants, gems, raid buff, etc. that will let you stack these “stats.” Legion is apparently keeping these. Avoidance: Reduces your damage taken from area-of-effect attacks. Gem slots, while not being a “stat,” are also quite uncommon. Anyone can be a Death Knight except Pandarens. Obviously the Lich King either wasn’t aware of them or just wasn’t interested. 2% extra dodge is a nice ability for Tanking and PvP. Less useful for DPSing in raids. Shadowmeld is occasionally a great ability. You can lurk in wait in (battleground or world) PvP or break incoming spells if you ‘meld just as the spell is launched. In PvE it will drop aggro if things go bad. Don’t do this if you’re the tank, you’ll get on the “undesireable tanks” list. However, if you’re dungeoning and you’re tired of the group, why not let the Boss eat them? Hopefully you won’t have much use for the “quicker movement while dead” ability. Night Elves gain +1% Crit by Day and +1% Haste by night. A Heal over time effect is rather nice, even for the nearly indestructable Blood DK. Draenei gain a Strength bonus (Heroic Presence) which scales with level. Those massive muscles have to be good for something, right? Escape ability is great for PvP and allows the use of two DPS trinkets, instead of one and an escape trinket. The escape will disable some pve/raid mechanics, which is especially nice if you’re the tank. Diplomacy allows you to gain rep with any of the many available factions a bit quicker. Humans also gain +2% to all secondary stats: Human Spirit. 1% extra crit is decent. A sprint ability is always useful. Dwarves also have Might, which improves Critical bonus damage by 2%. Their escape ability is nice for PvP (as is their size) and will occasionally help in PvE. Gnome DKs have an additional 5% Runic Power. More damage from ghoulie (Unholy only) is always useful, even if it is only 1%. Resistance to stuns has some small utility, especially in PvP. Increased Stam is nice. Even though it doesn’t scale well at very high levels it’s still a nice boost. War Stomp, an always useful ability, stuns close opponents. Being massive, the Tauren gain Brawn, which improves Critical bonus damage by 2%. Arcane Torrent is a generally useful ability which briefly silences casters and restores some Runic Power. Non-player casters are interrupted. Blood Elves also gain a +1% Crit Rating, Arcane Acuity. Increased attack speed (berserk) is a pretty ncie cooldown. Add it to a macro for those burst phases. Increased XP Vs beasts helps with leveling. Voodoo Shuffle reduces the duration of snares and such, which is occasionally useful. Wash away fear, sleep, and charm; More of a PvP ability but will have use every once in a while in PvE or while leveling. Drain life and restore some health from it. This is a passive ability which will add to your DPS and longetity. It will also be annoying if you grinding mobs that need to be left alive for some reason. In Warlords the Undead could indefinitely “breath” under water. This is retained in Legion. Rocket Jump can be a useful movement ability, into or out of combat. 1% Haste isn’t so hot for you, but it’s free. Vendor discounts will stretch the gold supply a bit, which is nice if you’re always broke. Bank access from anywhere has its uses. Each specialized (spec) of any class is defined by a set of unique abilities while the talents can be picked up by any spec. These are the abilities for the Death Knights. Hover over the links for the descriptions. Level 55 – Death Gate – Open a gate to Ebon Hold, either to grab a runeforge or to escape something, or just to take a nap in a safe place. 55 – Death Strike – Solid strike that heals you for some damage. Costs Runic Power in Legion. 55 – Plate Specialization – +5% Str for wearing only plate armor. 57 – Anti-Magic Shell – A personal barrier that blocks magic and generates runic power. 58 – Dark Command – Order the target to attack you. 60 – Wraith Walk – Sort of a 3 second sprint that breaks roots. 61 – On a Pale Horse (P) – Ride a little faster. 62 – Mind Freeze – Interrupt a spell and sincelence that spell school for 3 seconds. 66 – Path of Frost – Allow you and your party to run/ride on frozen water. 69 – Control Undead – Make an undead (not player) your minion for 5 min. 72 – Raise Ally – Raise a party member from the dead. Note: He/she does not come back as a ghoul. Soak a lot of damage and dish it out. This is the tank spec. Use the power of Frost to lay waste to your enemies. Disease and corruption in your Forte. You also get a pet. 55 Heart Strike – Whack the target and his buddy and slow them both. 55 Marrowrend – Smack the target and generate 3 charges of Bone Shield. The charges stack with followup Marrowrend strikes. 56 Blood Boil – 10 yard area effect that its hard and infects all enemies with Blood Plague. 56 Death and Decay – Corrupt an area of ground, doing damage to all in the area. Empowers your Heart Strike to hit 3 additional targets. 57 Dancing Rune Weapon – it mirrors your attacks for 8 seconds and adds +40% Parry. 57 Vampiric Blood – +30% health and +30 healing from any heals for 10 seconds. 58 Death’s Caress – Reach out to touch someone and give them the (Blood) Plague. 60 Veteran of the Third War (P) – More Stamina and Armor. 63 Crimson Scourge (P) – Your auto-attacks might give you a free death and Decay. 64 Gorefiend’s Grasp – Pull all enemies within 20 yards of the target to that target. 3 min cooldown. 78 Mastery: Blood Shield (P) increases attack power and your Death Strikes give you a small absorption shield. 1 Dual Wield – wield two one-hand weapons. 1 Runic Empowerment (P) – chance to gain a rune every time you spend runic power. 55 Frost Fever (P) – damages you opponent over 24 seconds and has a chance to return some Runic Power. 55 Howling Blast – damages the target and all others within 10 yards of the target and applies Frost Fever to all of them. 55 Frost Strike – Use your Runic Power to whack the target. 55 Obliterate – Your main strike. Single target. 56 Killing Machine (P) Your auto-attacks have a chance to make your next Obliterate an automatic crit. 57 Pillar of Frost – Immunity to some movement effects (such as knockback) and +20% strength for 20 seconds. 57 Remorseless Winter – lasts 8 seconds and damages all nearby enemies and slows them. 57 Empower Rune Weapon – activate all runes and gain 25 Runic Power. 58 Dark Succor (P) – killing worthy enemies gives you a free, empowered Death Strike. 59 Rime (P) – Your Obliterate has a chance to give you a free Howling Blast at +300% power. 63 Chains of Ice – shackle the opponent with icy chains and greatly slow him for 8 seconds. 65 Icebound Fortitude – immunity to stuns and 20% less damage for 8 seconds. 78 Mastery: Frozen Heart (P) – improves all Frost damage. 1 Runic Corruption (P) every Runic Power you spend gives you a chance to speed up your Runic Regeneration for 3 seconds. 55 Raise Dead – raises your ghoulish associate. 55 Death Coil – blast the enemy with Shadow. 55 Scourge Strike – whacks the enemy, bursts a festering wound. 55 Festering Strike – hard strike that inflicts 3-4 festering wounds. 55 Outbreak infects the target with Virulent Plague, which can then infect other targets. 56 Death and Decay – Corrupt an area of ground, doing damage to all in the area. Empowers your Scourge Strike to hit all nearby enemies. 64 Sudden Doom (P) – your auto-attacks have a chance to make your next Death Coil free. 74 Dark Transformation – your ghoul powers up for 20 seconds. 78 Mastery: Dreadblade (P) – boosts Shadow damage. 82 Army of the dead – Summons a horde of ghouls who will fight for 40 seconds. Any DK spec will get to pick any one talent from each row, for a total of seven talents at level 100. The PvP talents that you will gain at 110 are in addition to these. In Legion you can change specs at any time that you are out of combat. Changing the individual talents requires you to be in a “rested XP” area: big city, your garrison, or an inn. In neither case do you need to use reagents, trainers, tools, or sacrificial rites. Just change them up as you desire. Also note that in Legion all DK spec have, mostly, different talents. Take some time and get them set up ahead of time and you’ll be able to easily switch specs later, you you need to. You can apply runes to your weapons to make them more effective. These runes do not stack with enchants, but are generally better anyway. Simply Death Gate back to the Ebon Hold and apply the runes at a Runeforge. Only one rune at a time (per weapon) may be applied, but if you’re Dual Wielding you can apply a run to both weapons. Generally Rune of the Fallen Crusader will be the choice when you hit level 70, but you might want to experiment with the others. Rune of Razorice, level 55 – Does additional Frost damage and increases target’s vulnerability to Frost damage. Rune of the Fallen Crusader, level 70 – A chance to increase your Str by 20% for 15 seconds and to heal you for 3%. Rune of the Stoneskin Gargoyle, level 72 – 4% more armor and 2% more Stamina. Go for the gold – check out our gold guide.